To say that I’m happy with the way that the new kitchen paint turned out would be the understatement of the year. I am ecstatic! Overjoyed! Thrilled! Just completely in love with the results. 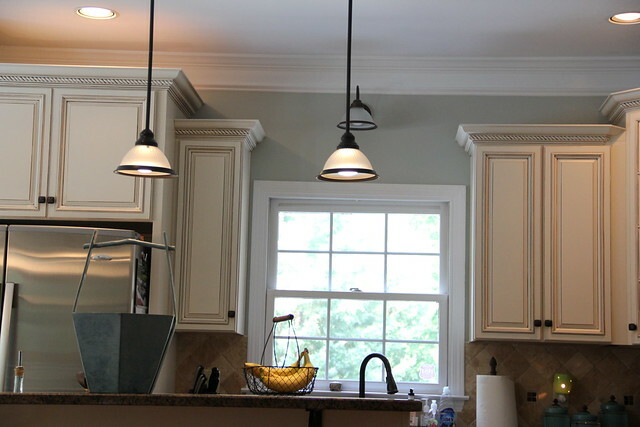 I chose Restoration Hardware Silver Sage for the paint on the walls, and we also chose to add an extra few inches to the crown molding by using picture molding about 3″ beneath the existing crown and painting it all one color to match. Great decision there. This paint changes with the light. When it’s bright outside, it’s a light blue/grey color. When it’s cloudy outside, it’s a warm green/ grey color. When it’s dark outside, it’s a cool silvery grey color. It’s the chameleon of paints, I tell you. That column really needs to scoot over so I can get a clear shot of the whole room! And today with the new fresh coat of light blue/gray/green goodness on it and what appears to be some sort of alien spacecraft blasting off outside the window…. The Restoration Hardware Silver Sage paint color looks great with the cabinetry and the countertop and the kitchen table and the rug and the floors! You can’t ask for much better than that. The breakfast nook is about 50 jillion times better in blue than the old yellow paint. Garrett jumped into one of my shots and I just have to show y’all his cute face. He makes me laugh. Here is the before with the previous owners salmon colored curtains that I agonized over taking down. Um. Yeah. Now I don’t know what took me so long. And the after with the valances removed and new blue paint. 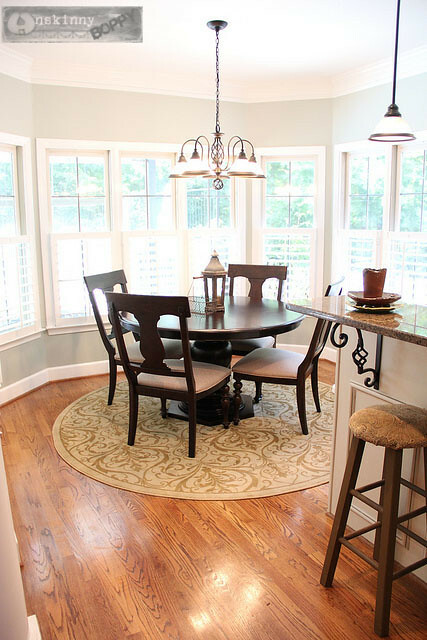 Ahhhhhhh… It’s like my Paula Deen table went to the spa and came back all rejuvenated instead of jaundiced. 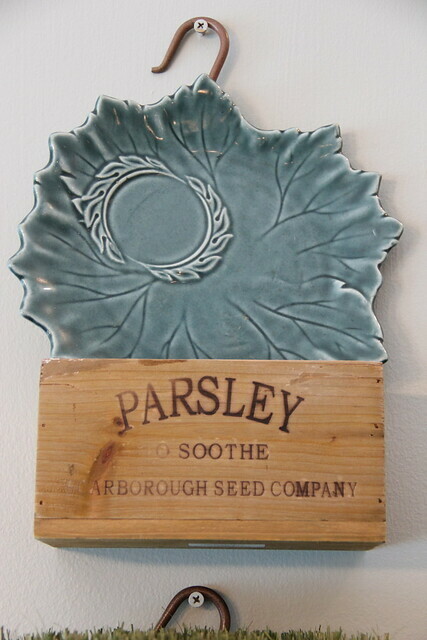 Even my favorite Scarborough Seed Company parsley, rosemary and thyme nesting herb boxes got decorated after they went back up on the wall this time! The top one got a vintage Steubenville Woodfield blue leaf plate that I picked up at a yardsale last week for $2.00! The middle one got a bundle of green grassy stuff that I’ve had for years (originally from Homegoods, I believe?) 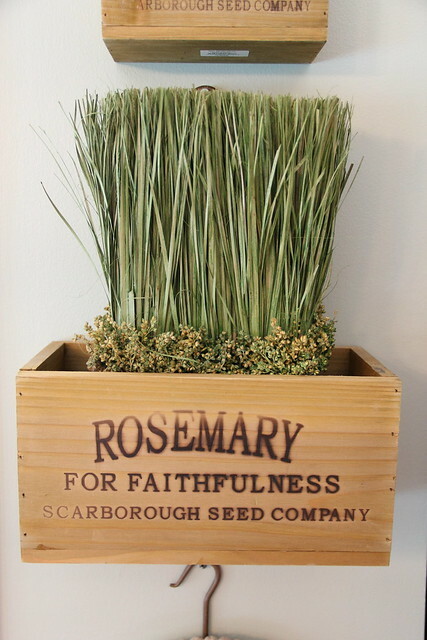 NOT rosemary, obviously. The bottom one got an assortment of my favorite Willow House Villa Stoneware plates. Here is a shot looking towards the butler’s pantry and dining room. I traded out the little slate topped telephone table that I had in this corner for a grey slatted table that I bought from The Foundary a few months ago. I put a small chicken wire basket there in hopes of taming the clutter that is our junk mail. In the past this little area has turned into paper stacking central, but I’m giving myself a pep talk and making it pretty in an effort to keep it from piling up again. I’m loving the rustic little display on the bottom. Those log slices (aka Basswood rounds) are my decorating bread and butter these days. i use them for everything. 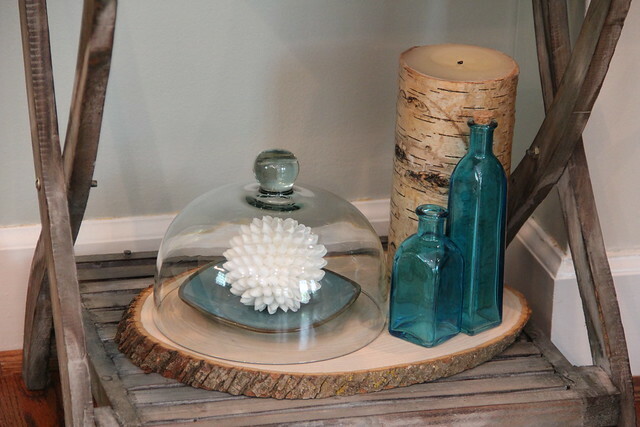 That cloche is actual the top from a cheese dome I bought from the Pier One Outlet in 2004. Love a multipurpose piece with longevity. I’m combining my love of the mountains and the ocean with a weird little combo of birch bark candles and seashells but I think it works! We’ll see how long it will last with a 3 year old running around. 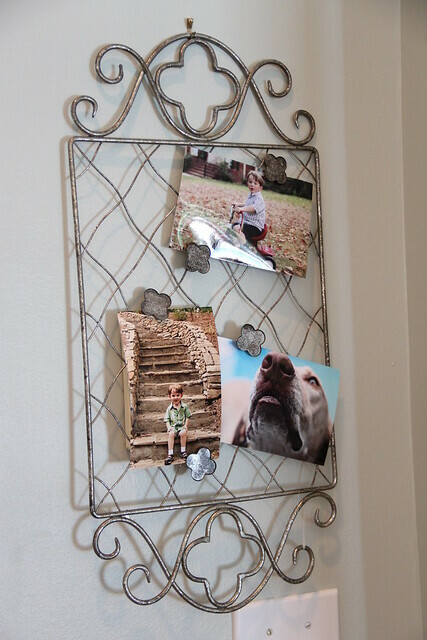 I love the quatrefoil design on this Willow House Keepsake card and photo display thingie. It’s so pretty! I need to find a new spot to hang my keys, though. My encaustic photo frame is super happy sitting on this new blue wall! 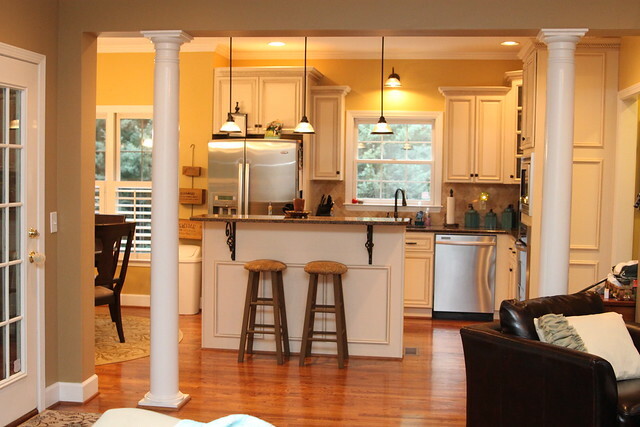 I could just not be any happier with the way the kitchen turned out. I’m SO happy I chose this paint color in here! I was so worried about choosing a paint that would make my glazed kitchen cabinets look really dingy or dirty but this paint doesn’t do that at all. If anything it makes them look LESS dirty than the yellow. More vanilla and less lemon. I can dig it. It’s perfect. This paint makes me so happy. Total mood lifter. Hooray for blue! 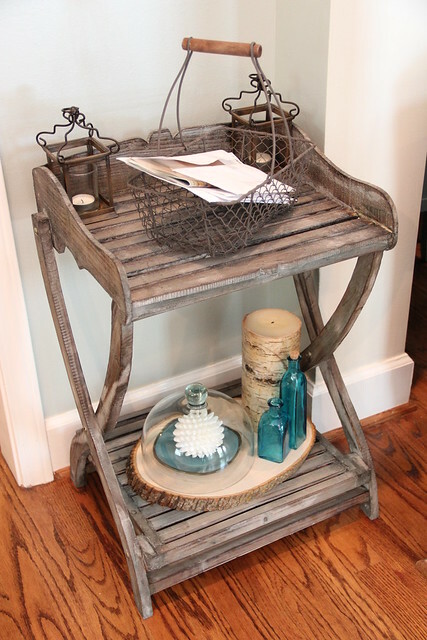 I love you, Restoration Hardware for creating the perfect grey/blue paint! 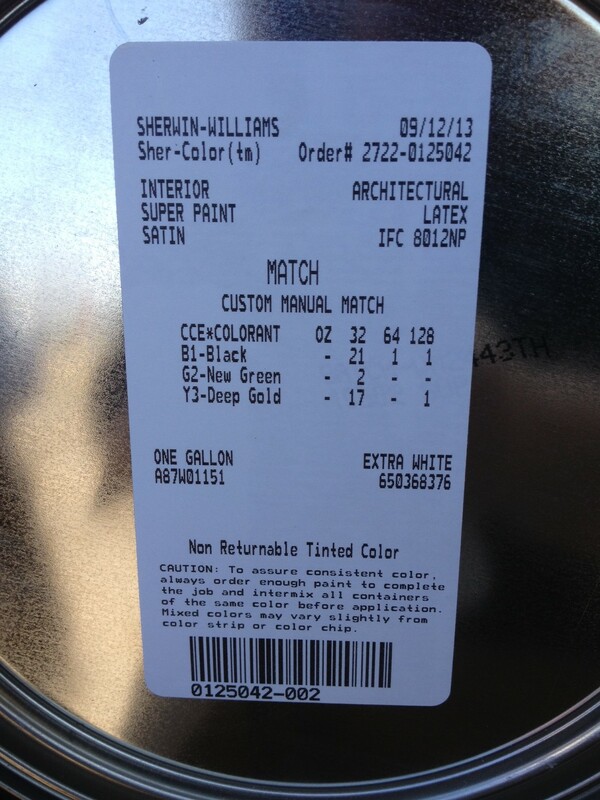 For those of you who asked for the numbers from the paint can lid to get this color matched at your local Sherwin Williams, here you go! Hope this helps! « A house painting update. WOW! reeaaally pretty & a good choice! Love love love! We used silver sage in our master and I think it’s just about the perfect color. Bravo!!! I LURVE it! Like, a lot. A lot a lot. 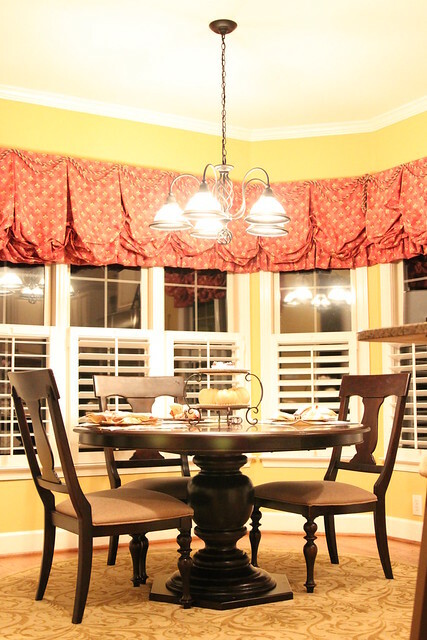 So much in fact, my dining room may go from yellow to this color in the very near future. P.S. 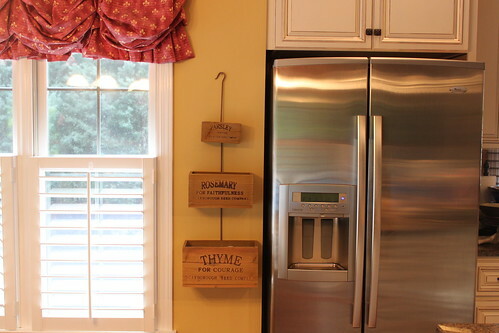 My herb crates arrived and I’m hanging them right now!!!!!!!!!!!! Can you tell I’m pretty excited about it? I’m so glad I asked you about them! Thanks so much everyone!! I’m really ecstatic about the way it turned out! @Mindy– Be sure to share your pics!! Can’t wait to see them! My first thought about the new paint color was that it makes it look cool and crisp. I love it!!! So beautiful, Beth! You knocked it out of the park with this one, babe! Blue for sure – it looks just gorgeous in there!!! 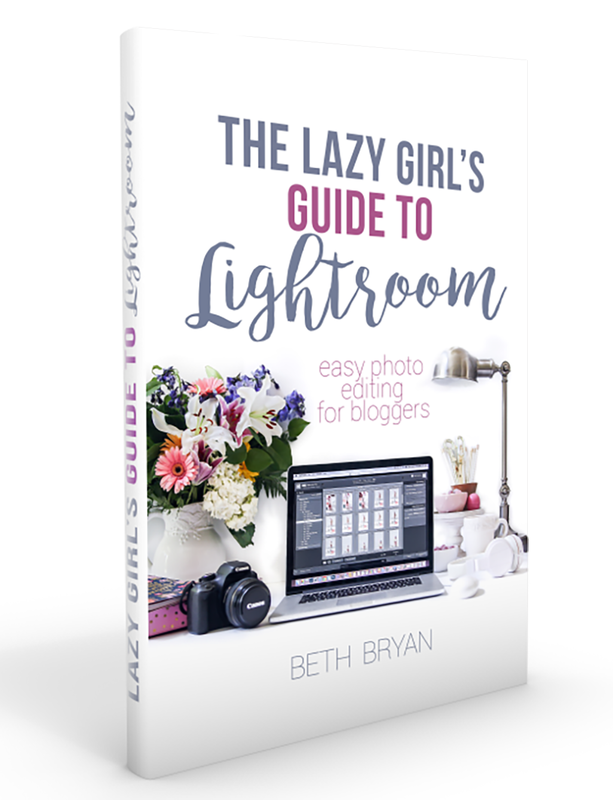 Hi and this is my first time to your blog! Oh, my goodness! 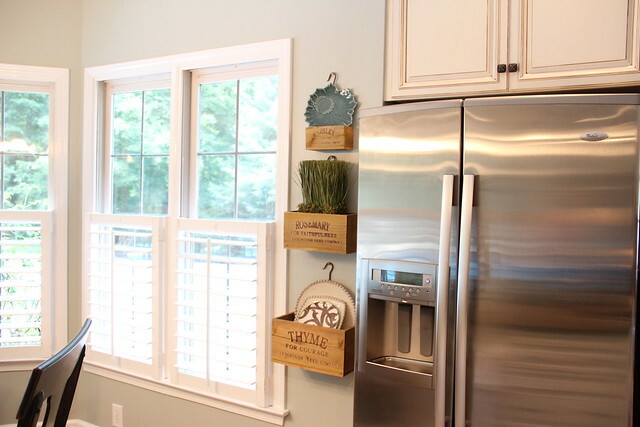 Your kitchen looks so gorgeous! I love your pretty new wall color! 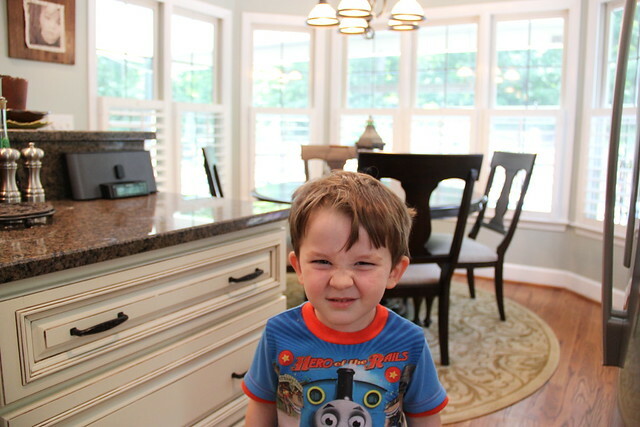 I am totally in love with your wonderful kitchen – it’s beautiful! what a huge difference! it is so light and cool feeling now! fresh, airy, and lovely!!!! GORGEOUS kitchen! What a great example of what paint can do for a space. That color is just dreamy. 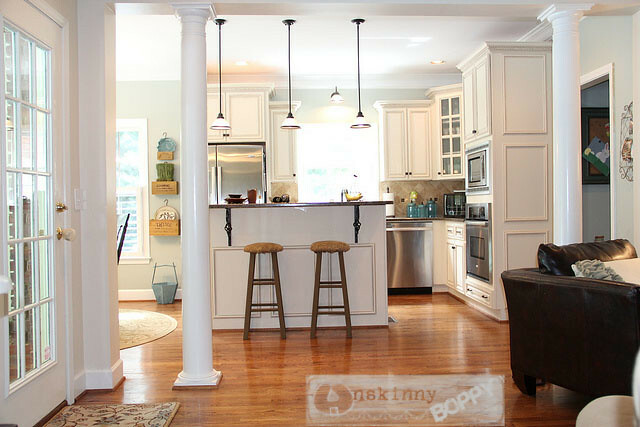 I’m putting your kitchen in the PoPP Spotlight. This is beautiful! 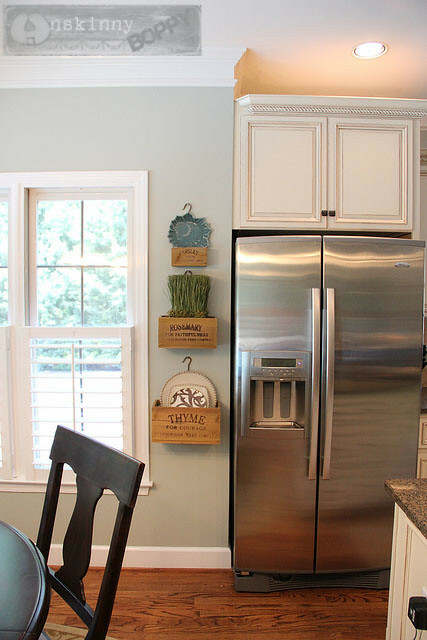 I love blues and it makes your kitchen look so much brighter! Do you remember where you got the herb boxes? I love those! Now following you. The new colour makes your kitchen so much brighter. It is a wonderful kitchen! Your new kitchen is absolutely beautiful!! Found you over at Domestically Speaking. absolutely lovely!! 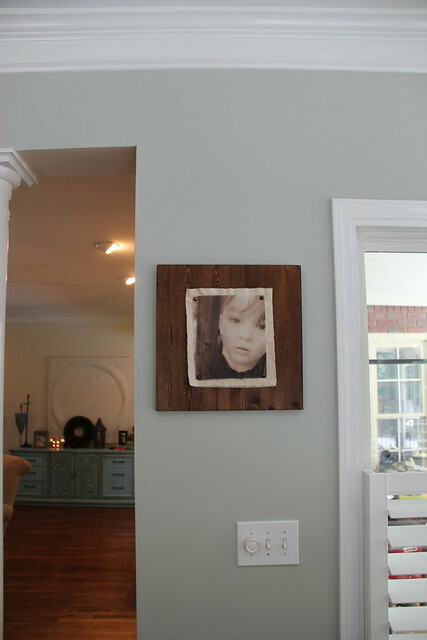 Found you through the mantel party…which is lovely too, btw! I think I’ll stick around for a while and explore your beautiful home! What an amazing transformation paint can make! wow!!!!! Your kitchen is scrumptious! 🙂 I see a gallon of paint in my very near future! I’m in love with your kitchen! The new paint in perfect. Pinned it! I love this color as well! I used it in my bedroom and then at half tint in my kitchen. LOVE IT. Is the paint from Restoration Hardware or did you have SW color match? I’m getting ready to paint my kitchen (similar cabinets) and most of the 1st floor Silver Sage, but my sample from RH looks really green. I love how yours turned out, it’s exactly what I’m hoping for. 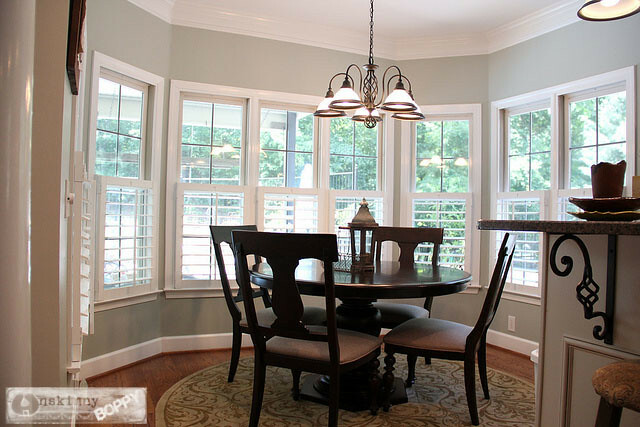 @Casey it’s the RH Silver Sage from the Silver Sage collection colormatched at Sherwin Williams in a satin finish Superpaint. In daylight it looks blue/gray, but at night it’s more green / gray. It’s a perfect color. I love it!! @ Casey – I tried to use Silver Sage in my daughter’s nursery about a month ago and when I put the sample on the wall it was a VERY dark green as well. Looked NOTHING like the beautiful color that I have seen all over the internet. I was horrified and rushed to Lowes (painters were coming the next day)to try to find another color I liked. It was so bad that I am sure there must have been a mixup when they sent me the color. Was yours that dark? Perhaps they had a major mixup in the RH paint dept.??? 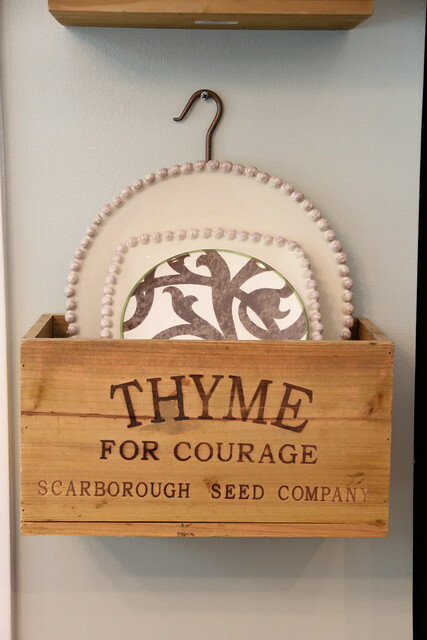 Beth, I just found your blog for the first time, and we are considering painting our kitchen this kind of silvery, pale robin’s egg, different in different lights kind of blue 🙂 You’re kitchen looks fab, and I really love the herb boxes. Looks fantastic! 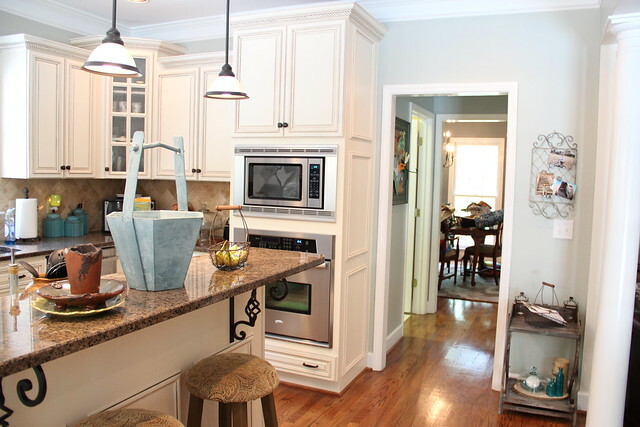 Any idea where those iron corbels are from supporting the breakfast bar? This post has inspired me and I want to get this color at SW as well. Beautiful. I don’t suppose you could share the numbers on the top of the lid? Maybe a quick phone pic? I am just afraid I will go in and they won’t get the match right and I will be sorry! This looks AMAZING!!! Absolutely LOVE the new color and your house is just gorgeous. Beautiful! I love the color! Where do you buy Restoration Hardware Paint? Hi, I just wanted to say that I love your kitchen! I have also been planning on painting my entire first floor silver sage. 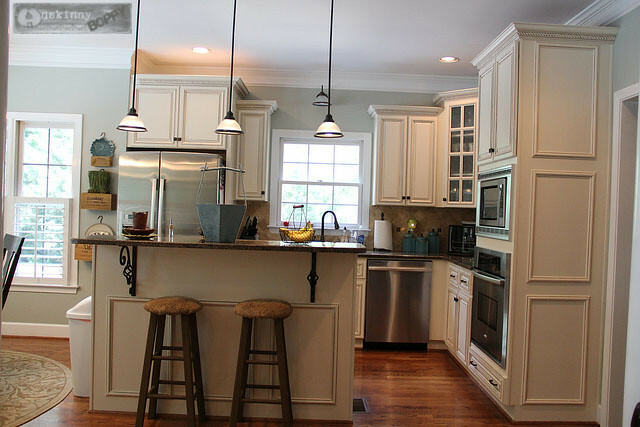 I have been looking for the perfect paint color for my cabinets, and I was just wondering if you knew what color was used on yours. Any info would be super helpful! Loooove this color! 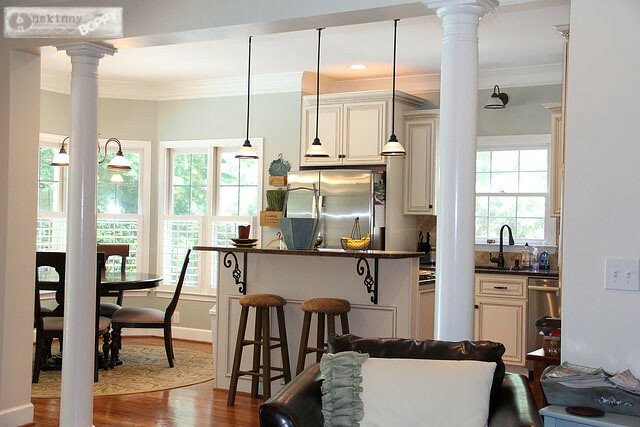 Getting ready to paint our kitchen and would love to get this from Sherwin Williams. Can you tell me the paint # on your can. I want to make sure it comes out to look the same as yours. Thanks!! 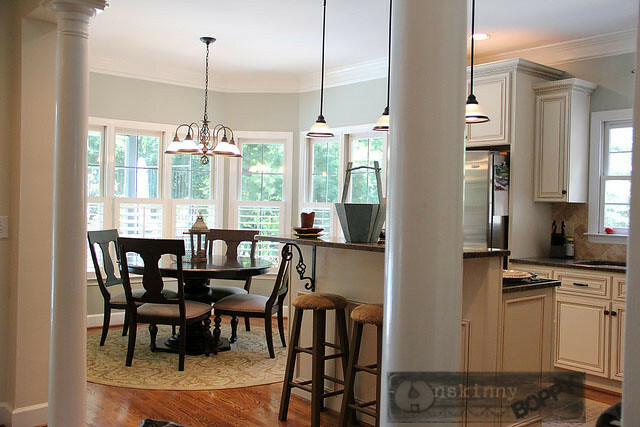 Hi Beth: Like so many before me, I think your “new” kitchen is gorgeous! I would also love to know the formula of your SW color match for RH Silver Sage. Thank you so much! I love silver sage and have used it in a few rooms. I’m about to use it in a room that we are putting in custom cabinets, and I need the right cream color to get along with the wall paint. I’ve been agonizing over it. 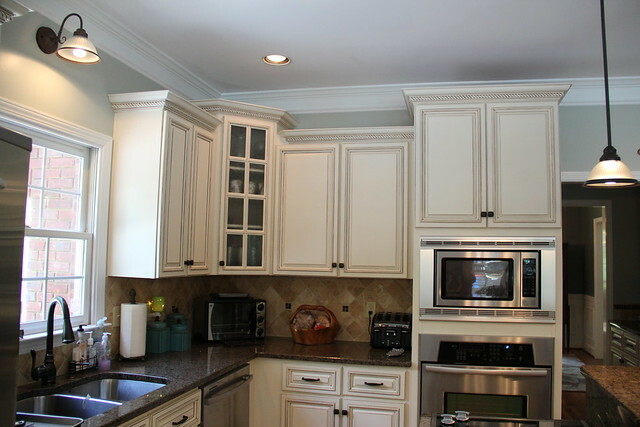 Do you know the paint color on your cabinets? Thanks. Thank you so much for sparking my imagination! I have been looking for new room colors since mine are so due for updating (I too have a yellow kitchen)! I want to play with fun but not too crazy colors! I love Silver Sage.. so perfect. Thank you for sharing the paint recipe as well. May I ask what other colors you used as complementary colors? I have several rooms to repaint. Thanks so much for your website 😀 Keep up the great work!! That is one amazing transformation. The difference the right paint color can make it unbelievable. I LOVE the next color. The kitchen looks gorgeous. Thank you so much for this post. I found you in random search as I struggled between SW Sea Salt an Comfort. – neither of them perfect. I think this sits right between the two an could be the one! I can’t wait to run out tomorrow and buy a sample. Your kitchen is beautiful!! I see that this post was from a few years ago… are you still loving the color as much today as you did then? 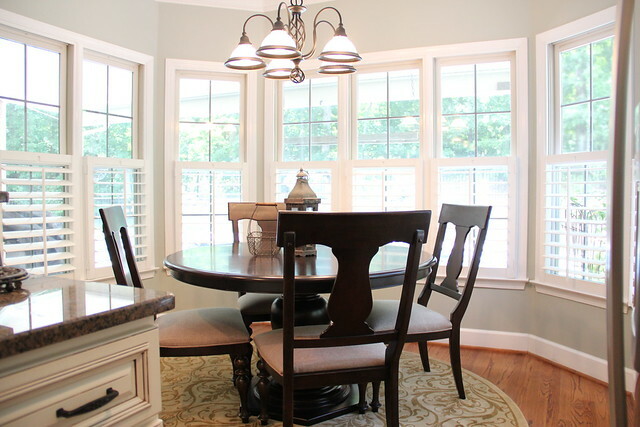 I am considering using your Sherwin Williams custom color for my dining, kitchen, living room as well!